After last month's post I'm pleased to say that I have managed to play six medieval games. The games used armies built from the medieval Field of Glory (FOGAM) lists but used the renaissance (FOGR) points and rules. For those interested in more detail there's a somewhat dated comparison of the two rules sets on the Slitherine forum. 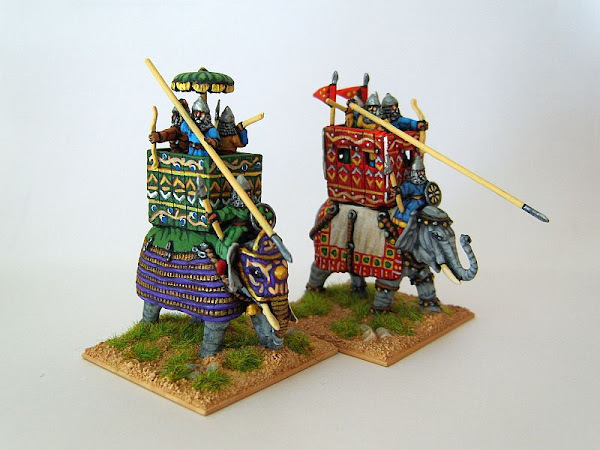 So far I have fielded a Timurid army (complete with elephants), a Later Polish army (two variants with knights and mixed battle groups), a Mongol Invasion army and an Ilkhanid Mongol army with Armenian allies. Links to the lists are given at the end. My opponents have been variants of the early and late Russian lists. Early on we decided to resist the urge to change any of the rules and I think this was the right decision. All games played roughly as we expected and were without major rules incident. In general, the armies were larger by one or two battle groups as the medieval troop types cost less in FOGR. This was most obvious for medieval drilled knights which cost a lot less when taken as gendarmes. This means the games lasted a little longer but not significantly so. Command and control under FOGR makes all medieval troops undrilled and therefore harder to manoeuvre. The odds of passing a standard CMT (Complex Move Test) change from 58.33% (FOGAM drilled) to 41.67% (FOGAM undrilled and FOGR). This wasn't a real problem but I've been playing FOGR exclusively for three years. I suspect a FOGAM player new to FOGR might find it a touch frustrating at first. Using gendarmes is a lot easier than using knights especially undrilled knights. Despite being more difficult to manoeuvre they are not impetuous in FOGR and will only charge the enemy when ordered to do so. You no longer need to take repeated CMTs to hold them and therefore do not run the risk of failing and launching an unwise charge. In the final game (of six) I did run into a few minor issues regarding gendarmes and pursuit but nothing serious. Medieval spear armed cavalry really do have to either stay back or advance quickly to melee against bow armed cavalry as they suffer badly from shooting (as they do under FOGAM). Despite this I don't think they should be given a light lance (see previous post) as this would make they far too effective even after you've taken the increased cost into account. The Polish army had both foot and mounted battle groups; which is why I choose to use this army. The foot are a mix of spear and crossbow and this combination raised no issues. The mounted battle groups of gendarmes with supporting crossbow armed cavalry raised nothing either once I realised they behaved exactly the same as knights with supporting cavalry. Battle wagons: wow! The FOGR movement rules for these are complex. In summary they must pass a CMT to carry out any move (P57) but can then about face whilst stationary (P61). As to turning to the flank a 2x2 battle group can turn 90 degrees in to a 1x2 battle group (normal foot battle group not in column). Single elements (if they exist - superior battle wagons?) and columns of battle wagons cannot turn as there aren't enough bases to match the original depth (P61). Weird! One 90 degree turn is all you get with a 2x2 battlegroup and then it's "column" all the way but you can about face to your hearts content. If you start in column that's it! Light spear armed light horse are quite common in FOGAM. Without the additional rule one "flavour" of light horse is lost. It would provide an alternative to the light lance for medieval spear armed cavalry suggested elsewhere, however I am still of the opinion that a POA is not required. It's always tempting to tinker with established rules (as the above shows) but I don't think I'll be asking for a change or adding to the FOGR rules because it would be the first step on a very slippery slope. 1300 - Ilkhanid Mongol - with Armenian allies.